Dr. Hassan Abbas is a senior Advisor at the Asia Society and the editor of Watandost blog. He is based in Washington D.C. He is terrified orator and has written two books. The idea of defiance against tyranny and oppression owes a great deal to Husain ibne Ali, the hero of the battle of Karbala in 680 AD With just 72 valiant followers and family members, the grandson of Prophet Mohammad faced the military might of the Muslim empire ruled then by a despot. Yazid bin Muawiyah. Husain refused to sanctify Yazid’s reign through baya’a (allegiance) and consequently, he and his small contingent were martyred in the most brutal of fashions. The accompanying women and children were imprisoned for months in the dark alleys of Damascus. On every Ashura, the 10th day the Muslim calendar month of Muharram (which fell on December 6 this year), many Muslims all across the world commemorate Husain’s great sacrifice, but tragically the central message of Karbala appears to evade the broader Muslim thinking today. In Western literature and research on Islam, this episode is often viewed through the lens of certain Shi’a rituals practiced on and around Ashura. It is worth probing why that is so. Even more importantly, it is critical to understand why terrorists and extremists like al-Qaeda and the Taliban often attack the Ashura related gatherings (as is evident from attacks in recent years in Iraq. Afghanistan and Pakistan), and what is at the core of their disdain of all the things that Imam Husain stood for. This was not a mere political battle, though some Muslim historians try to project it that way so as to cover up not only Yazid’s atrocities, but indirectly to defend his school of thought as well. The mainstream view, however, both among Sunni and Shi’a Muslims, is very sympathetic toward Imam Husain. It would be an absolute travesty of Muslim history to call this a Sunni-Shi’a battle. Some writers still do that, either out of lack of in depth, Understanding, or in a flawed effort to simplify things for a lay Western reader. On the Muslim side, only a handful of controversial clerics project this version. Still, most Muslims shy away from digging too deep into the matter, and carefully avoid questioning the historical developments leading to the rise of Yazid. Insightfully, the whole narrative of tragedy of Karbala would have remained unheard of without the tireless struggle of Husain’s sister Zainab binte Ali, who as an eyewitness of the tragedy, propagated details of the event far and wide among Muslims. While in chains, she courageously challenged Yazid’s policies on his face in his court in Damascus soon after the battle at Karbala. Many Muslims-some out of ignorance and others out of bigotry, avoid appreciating the crucial role of a women in this grand struggle. Zainab’s contribution to fighting for the essence of the Muslim faith was as critical as that of Husain. 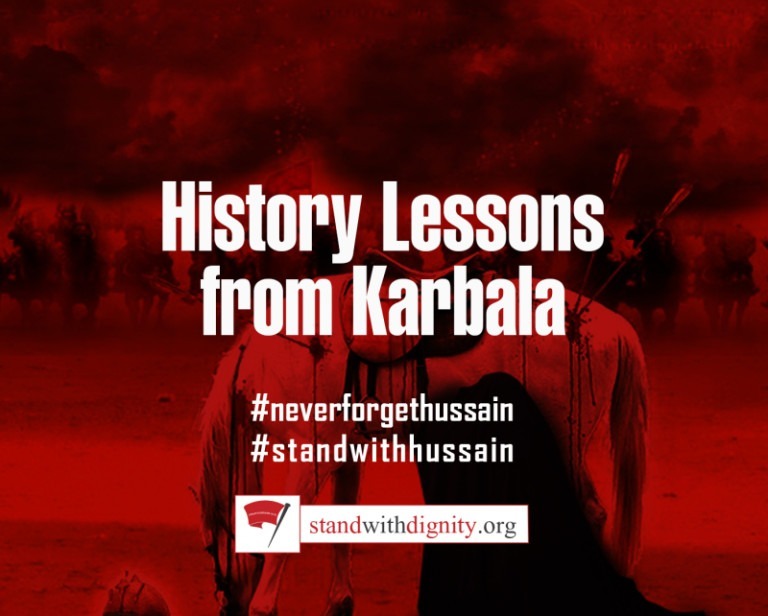 Though Shi’as are often at the forefront of commemorating the tragedy of Karbala, Sunnis, especially those belonging to the Barelvi school of thought in South Asia and almost All Sufi circles in broader Asia and the Middle East, also enthusiastically participate in paying homage to Imam Husain and his companions. Extremists and terrorists among Muslims want to destroy this element of unity, as sectarianism suits their divisive and violent agenda. Distorting religion to make it dogmatic in outlook and regressive in approach is also what helps them achieve their goals exceedingly well. For them, political power is an end in itself. Husain’s message stands completely contrary to this perspective. The attack on Shi’a Muslims observing Ashura in Kabul on December 6, which killed 55 people, was a manifestation of the perpetrators’ perverse worldview. Next door in Pakistan, where this threat is more pronounced, a heavy price (in the form of terrorism and violence) is being paid for ignoring the expanding tentacles of religious extremism. Though things remained peaceful on Ashura in Pakistan this year, the Kabul attack was claimed by a splinter wing of a banned Pakistani sectarian group. Lashkar-e-Jhangvi (Lej). Authorities have yet to uncover solid proof of who was responsible. Irrespective of whether the Afghan. Taliban was directly involved in this specific attack or not, their policies during the ‘reign of terror’ in Afghanistan (1996-2001) indicate that they hold similar views toward those who honor the martyrs of Karbala. Taliban massacres of ethnic Hazara Afghans (of whom the vast majority are Shi’a Muslims) in the late 1990s are a case in point. The curse of sectarianism has inhibited spiritual growth of many Muslims. The remedy to the malady lies in mainstreaming the message of Karbala both within the worldwide Muslim communities and among those who are interested in deciphering the foundational themes of Islamic discourse. At a higher level, Husain’s message of defiance against oppression and personal sacrifice for the cause of humanity is applicable for a broader audience for generations to come.